These are lyrics by Claudja Barry that we think are kind of funny. 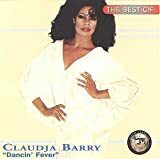 Claudja Barry's, "Boogie Woogie Dancing Shoes"
At one point in the song the male backup singer with the real deep voice sings the chorus to the song alone including this line. Like he wants to be "queen for a night" (which is not literally possible for a male, since a queen is a female entity). It just sounds funny hearing a guy sing it.